College is a place where you often find yourself. The things you do and the people you surround yourself may define the person you ultimately become. Inspired by her own experiences, Una Aya Osato shares the world of college rugby and the team that became her family in With You. Osato offers the story of her time on her school’s inclusive rugby team where the people she shared the field with shaped her life. Learning the rules of the game, the chants and songs, and how drinking and making out is essential for team bonding, Osato may be alone on stage but she certainly brings along the whole team. 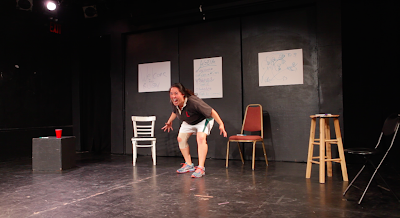 With a foul mouth and high energy, Osato gives a marathon performance. She literally does laps around the stage. Director Nelson T. Eusebio III incorporates movement from start to finish in Osato’s performance. And perhaps, it’s too much. Osato’s narrative demonstrates action on the rugby field but they lose the charm as we’ve already seen her throw herself across the stage. Perhaps finding moments of stationary monologues could heighten the beats where Osato does move around. Eusebio should trust Osato’s ability as she is a brilliant storyteller. Osato is engaging, holding the audience at the palm of her hand. While her vocatl characterization of her teammates may not have been that different, you were still able to decipher who was talking when because of her physical shifts. Osato’s willingness for physical comedy kept the audience in stitches. She has Melissa McCarthy vibes in her performance. Because Eusebio utilized the entirety of the stage, the lighting was a basic, and sadly unfortunately looking, wash. Yet the moments when the piece was granted a more theatrical look, With You was given a breath of life. These lighting looks were stunning. Going back to the simplicity in staging will allow Eusebio more of those stage pictures. With You is a triumph of a solo piece. The story is clearly special to Una Aya Osato, giving her full heart, soul, and body to the production. And by doing so, it becomes special to all who watch her.